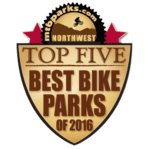 Voted #2 in the Top 5 Best Bike Parks in the Northwest region on MTBparks.com three years running! With spectacular singletrack trails winding through wildflower meadows and miles of technical lift serviced downhill trails, Grand Targhee Resort established itself as the first downhill mountain bike destination in the Tetons. But this is only part of the story. With incredible trails both on Teton Pass and at Jackson Hole Mountain Resort the region is slowly and quietly becoming a downhill mecca. During the summer months when the West is sweltering, Grand Targhee and the Tetons might be the most extraordinary, cool temperature riding in the lower 48! Explore over 2,200 vertical feet of lift-serviced downhill and 70-plus miles of multi-use trails for cross country and downhill mountain biking, as well as hiking and horseback riding. The Grand Targhee Bike Park offers every style of riding for every level of mountain bike rider: Gentle, banked cruisers; tight and twisty singletrack cross country; gnarly, rock strewn downhill; drop offs; and much more.